Whether you’re dealing with the appearance of fine lines or uneven skin tone, or battling more advanced signs of ageing, we have results-driven solutions for having truly younger-looking skin. Here’s how to deal with uneven skin tone, loss of firmness, dull skin, and more. Uneven skin tone has multiple causes, but it certainly goes hand in hand with ageing and sun exposure, especially if you don’t apply a sunscreen daily. Fortunately, there are products that can make an impressive, noticeable difference. Look for concentrated doses of ingredients proven to brighten dull skin, increase radiance, and refine skin. One of the best ingredients to address all of those issues? Vitamin C! Our skin-brightening solution: C15 Super Booster can make a world of difference to diminish the appearance of an uneven, dull skin tone and to revitalise your skin for a glowing, smooth radiance. Prevention: Keep your uneven skin tone from coming back by applying an SPF moisturiser loaded with antioxidants every day (rain or shine). If you prefer the "naked face" feel, try our light-as-water RESIST Youth Extending Daily Fluid. If you have normal to dry skin, our skin-enriching emollient SKIN RECOVERY Daily Moisturizing Lotion will be perfect for you. Skin loses its youthful firm, lifted appearance primarily due to age and unprotected sun exposure (wearing SPF is a must). Experts around the world, including us, know that retinol has an undisputed reputation as a superstar anti-ageing ingredient. It’s been shown to help diminish multiple signs of ageing as well as minimise enlarged pores and rough skin texture. Our ultimate retinol products: For more advanced signs of ageing (like deep wrinkles), our CLINICAL 1% Retinol Treatment goes above and beyond by also including vitamin C, peptides, and skin-replenishing ingredients. Its light lotion texture works best for someone with normal to dry skin. For a lighter-weight fluid formula that works perfectly for someone with normal to oily or combination skin, try our 1% Retinol Booster. Both of these superior retinol formulas can be used every day or every other day, depending on how you want to customise your skincare routine. 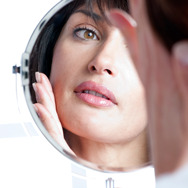 Want to know more about retinol? Check out our article, Retinol for Anti-Ageing. If you’re not already using a daily leave-on AHA (alpha hydroxy acid) or BHA (beta hydroxy acid, also known as salicylic acid) exfoliant, you’re genuinely missing out on a vitally important skincare step! These exfoliants gradually, gently, and without skin-distressing abrasion, naturally remove built-up layers of dead skin to reveal an unbelievably smoother, more radiant complexion. A daily BHA is ideal for dealing with clogged pores and those stubborn, tiny, hard, white bumps that occur primarily on your cheek bones but can show up in other areas too. It is even suitable for milia-prone skin.If you have blackheads, acne, or enlarged pores, try our CLEAR Exfoliating Solution with 2% Salicylic Acid. This liquid formula is best for oily or combination skin. If you have dry skin and clogged pores, choose our moisturising SKIN PERFECTING 2% BHA Lotion Exfoliant. A daily AHA is best if your concerns are rough surface skin, crepey skin, and/or loss of firmness. It’s especially helpful for addressing advanced signs of ageing. Our RESIST Daily Smoothing Treatment with 5% AHA will give you more hydrated plumper-looking skin and an ultra-smooth healthy glow. While it's true that no product can completely get rid of shadows or puffiness around the eye area, you can definitely make it look better and improve the appearance of the dry, dull, flaky skin that's sagging around your eye area. An extremely emollient cream loaded with skin-replenishing ingredients will temporarily plump and brighten skin and give a tired eye area the moisture it needs to look supple, smooth, and young again. Our RESIST Anti-Aging Eye Cream is among the richest, most advanced eye creams you can use. It's smooth, balm-like texture works fast to replenish even the driest, dullest skin, steadily improving multiple signs of ageing. Most important, it keeps your skin hydrated all night long. The advice above will provide amazing results for your most frustrating skin concerns faster than you thought possible, but it will all be for naught if you don’t practice sun-smart behavior. The path to smoother, younger-looking skin is paved with daily broad-spectrum sun protection. Without that core step, nothing else you do to help diminish signs of ageing can give you the long-terms results you’re seeking. That’s because even the best products cannot overcome the type of damage the sun does to your skin. Adding the products above to your skincare routine pulls everything together and, with daily use, can visibly improve signs of ageing.